This book is the most comprehensive reference grammar of Choctaw, an American Indian language spoken by approximately eleven thousand people located primarily in Mississippi and Oklahoma. Based on nineteen years of field work with speakers of the Mississippi and Oklahoma dialects and more than 150 years of written Choctaw material, A Choctaw Reference Grammar contains the most complete description to date of the morphology of the language as well as a thorough treatment of phrase structure, word order, case marking, and complementation. The Choctaw tribe was divided into Oklahoma and Mississippi groups during the Indian Removal of the 1830s. Today the majority of fluent speakers among the Oklahoma Choctaws are more than forty years old, and few children speak the language. Although more children among the Mississippi Choctaws learn the language, the number is declining. Because language is vital to preserving the Choctaws’ way of life and both dialects of Choctaw are endangered, careful documentation of the grammatical structure of the language is critically important. 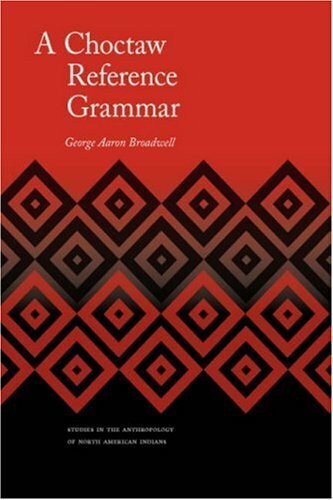 Compiled by the leading scholarly expert on the Choctaw language, George Aaron Broadwell, this volume is both a practical guide to Native speakers and an indispensable handbook for linguists. If you have any questions about this product by Brand: University of Nebraska Press, contact us by completing and submitting the form below. If you are looking for a specif part number, please include it with your message.